SCIMOS Z is made up of zirconia crystals which are mutually interlocked in a configuration similar to a jig-saw puzzle, giving it an extremely dense structure. Since it consists of a single-phase composition, the glass/refractory interface of SCIMOS Z is very smooth and no reaction layer is formed. 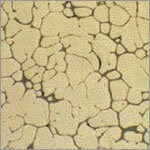 It reveals outstanding resistance to corrosion by exotic glasses such as hard boro-silicate and alumino-silicate.